Ever feel as though your dentist learned his drilling skills at carpentry school? A new VR dental sim is hoped to produce dentists that are comfortable with some of more extreme (and more painful) procedures. 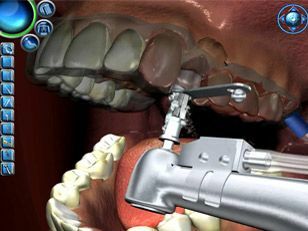 The Virtual Dental Implant Training Simulation Program was designed by faculty at the Medical College of Georgia School of Dentistry faculty and is designed to help students in diagnostics, decision making and treatment protocols. The implant simulation game uses multiple patients and clinical scenarios that can be randomly selected. It lets a student ask the virtual patients about their medical history, examine them and arrive at a diagnosis. Like humans, the virtual patients have different personalities, and students must tailor treatment based on the mental, physical and emotional needs of the individual. The simulation then ventures into a virtual clinical treatment area, where students decide the type, location and orientation of any required implants, the type of anesthesia and tools for surgery. "It's realistic. If the student doesn't place anesthesia in the right spot, the patient screams," says the project's director, Dr Roman Cibirka. Reassuringly, Dr Cibirka says that the learning tool is intended to supplement – not replace – actual clinical training.